Ryan and I are in the beginning stages of planning our next vacation. We actually started talking about it before our honeymoon, because there is nothing more depressing than coming back from a long vacation and having nothing to look forward to. There are several places we want to visit (especially in Europe) and we decided that 2012 would be the year for a Spain trip! We’ve done some preliminary research and we think we’ve decided on some destinations. However, the city we started with was Barcelona! We aren’t sure at which hotel we are going to stay, but we want to stay at a Starwood hotel (and use points) to save money. 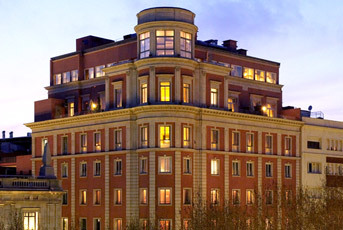 I found this hotel when we first starting talking about Spain and I fell in love! I’m a sucker for ocean views and large rooms with balconies. This hotel is 20,000 starpoints/night, which would be 60,000 (assuming we stay 3 nights). We have the points and could use them, but there are other hotels we’ve been thinking about staying at, and it would be nice to save points when possible. This hotel is relatively new, so the rooms are all very nice. There is a pool/bar area which looks fabulous! The views from this hotel are breathtaking. Location. It’s not as centrally-located as the other option. We would use 60,000 starpoints, instead of saving some for a different trip. There is no guarantee that we’ll get a nice room overlooking the ocean. I am a gold member, but upgrades are not guaranteed, and we’ll be going during the summer/fall, which is a popular time to visit. So, the hotel will still have nice views, but maybe not from our room. Location is great – right off of Las Ramblas, which is the place to be in Barcelona. This is “only” 16k starpoints per night, so we’d save 12k starpoints, assuming we stay 3 nights. Recent renovations, so the rooms will be nice. No pool. I’m not sure how much time we’d spend at a pool though, so this might not be a big deal. Not a nice view (city views are okay, but I wouldn’t pay big money for the view we’ll get from this hotel). So really, we have to figure out what’s important to us. Since we are early in our planning, it’s hard to know what our tentative schedule will look like. Will we have time to hang around the pool? Exactly how far away is the W, and is it going to be a huge pain? Is there an easy way to get from the W to the center of the city? Will we be going out late at night, without a way to get back to the W (if we stay there)? 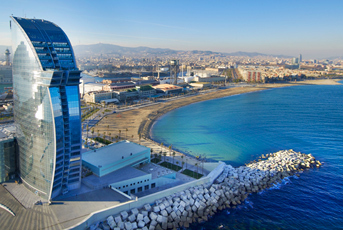 This entry was posted in Travel and tagged Barcelona, Spain, travel planning by Kristin. Bookmark the permalink.